There are more swords ‘n’ sorcery slots out there at the moment to make even the most Dungeons & Dragons-deprived slots fan weep. And speaking of D&D, if you enjoyed the thrills of their fantasy-themed Dungeons & Dragons: Crystal Caverns slot, you’ll love this. 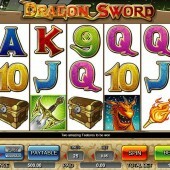 A 5-reel, 25-payline online slot from Amaya, Dragon Sword features some nicely-rendered graphics including a couple of – surprise, surprise – dragons (one awarding a 1,000-line bet jackpot if you hit five on the reels), a treasure chest, flaming torch, and some pretty uninspiring 9-through-Ace symbols. This has all the ingredients to get a fantasy-themed slots fan frothing at the mouth. Find the Knight to Earn 15 Free Spins! The Knight is Wild and substitutes for all regular icons other than the Scatter. Not only that, he acts as a bonus icon too, triggering a free spins round when appearing on Reel 1 and 5 at the same time. You’ll win 15 free spins that sees all winning combos doubled and the spins can be re-triggered. Oh, and I forgot to mention that Wild-forming combos are trebled. Huzzah! Trigger Pay Outs with the Mighty Sword! The mighty sword symbol, meanwhile, is the other Scatter. It appears anywhere and only two are needed for a payout. However, three or more anywhere on the reels will trigger the Dragon Sword Bonus. The game is essentially a Pick ’em bonus round – the dragon has hidden our brave warrior’s sword in a treasure chest and it’s up to you to pick the right chest to reveal it. You’ll get three chances to pick, and a cash award will be given every time you pick correctly. If you unearth the mighty golden sword, all cash awards will be trebled and the knight will go to town with his new-found toy. Sadly there’s no ‘skill’ style game here, as you get in some other slash n’ sorcery style slots, but the free spins alone are enough to warrant a play on this game. 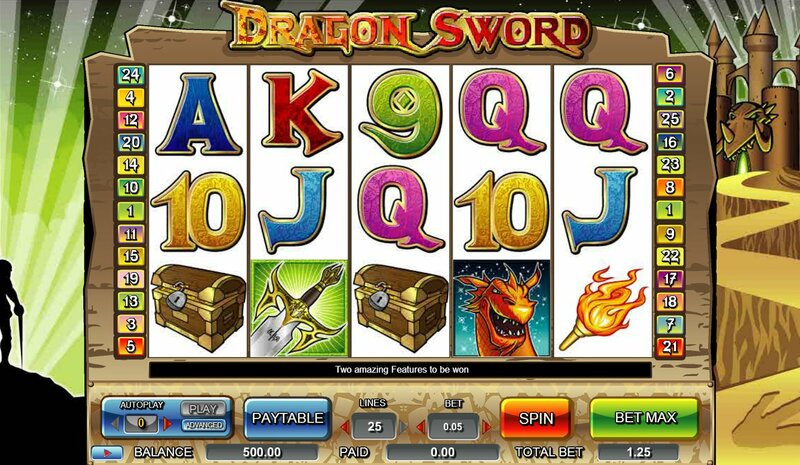 If you’re looking for more slashy thrills online, then the Dungeons & Dragons slots from slot developer IGT are perfect but NetEnt have got in on the act with the fire-breathing frolics of Dragon Island, and that probably edges things in the rank of best fantasy-themed slots.